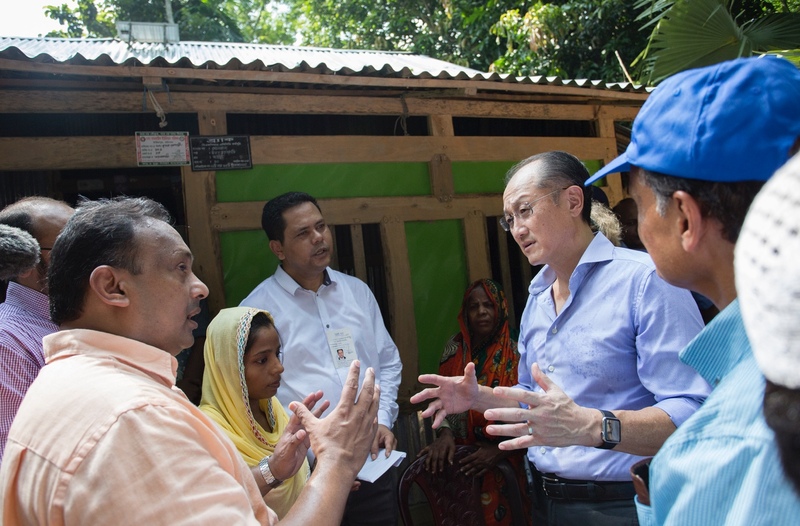 President of World Bank Group, Jim Yong Kim, visits family members who are beneficiaries of a solar project in Bangladesh, October 2016 (Photo: Dominic Chavez/World Bank). The World Bank Group’s core values – integrity, impact, and respect – guide our work with our colleagues, our clients, and our partners around the world. Our core values are embedded in our twin goals: to end extreme poverty by 2030; and to promote shared prosperity by boosting the incomes of the bottom 40 percent of the population in each country. These values guide how we design, develop, and implement our programs, and they help us ensure that everything we do benefits our clients: the poorest people in the world. The Compliance Advisor Ombudsman (CAO) plays a critical role in helping us live up to our core values. By providing an independent platform for people to raise concerns about the environmental and social impacts of projects financed by IFC and MIGA, CAO helps ensure the integrity of our investments. CAO promotes community-based solutions through dispute resolution and compliance, enhancing the impact of our work on the ground. Finally, CAO promotes a higher standard of accountability and helps us use scarce public resources judiciously, allowing us to serve our clients with the highest level of respect. I am pleased by CAO’s accomplishments this past year. CAO finalized numerous dispute resolution cases through effective mediation and recommended practical solutions that benefit both communities and companies. CAO issued new compliance investigations with findings that will help us close performance gaps and improve projects. And CAO disseminated timely and useful toolkits to advise IFC and MIGA staff and clients on how to strengthen project-level grievance mechanisms and avoid supply chain-related environmental and social risks. The role of CAO is more important today than ever before. With the adoption of the Maximizing Finance for Development (MFD) approach, the World Bank Group’s operations – including those in fragile and conflict-affected economies – are evolving to increasingly leverage the resources of the private sector. We must continue to adhere closely to IFC and MIGA’s environmental and social performance standards. To do that, we are taking steps to strengthen CAO’s governance, including an impact review and closer interaction with IFC and MIGA management. The World Bank Group has a rich history designing and helping finance public and private solutions, and the MFD approach – like all of our work – will continue to be evidence-based and focused on outcomes. We owe it to our clients to give them the best advice, which is informed by the lessons of the past and sets the highest environmental, social, and fiscal standards. CAO will continue to play a critical role in helping the Bank Group listen to the voices that we most need to hear, and with their participation, bring practical solutions to the communities we serve around the world.